Recognizes a protein of 110 kDa, which is identified as androgen receptor (AR). Recognizes a protein of 110 kDa, which is identified as androgen receptor (AR). It reacts with full length, and the newly described A form of the receptor. It does not cross react with estrogen, progesterone, or glucocorticoid receptors. The expression of AR is reportedly inversely correlated with histologic grade i.e. well differentiated prostate tumors show higher expression than the poorly differentiated tumors. In prostate cancer, AR has been proposed, as a marker of hormone-responsiveness and thus it may be useful in identifying patients likely to benefit from anti-androgen therapy. 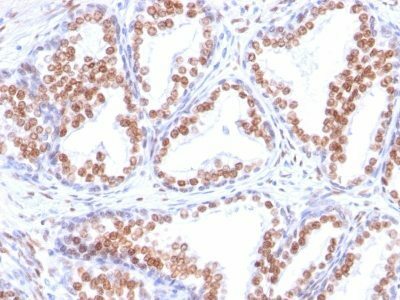 Anti-androgen receptor has been useful clinically in differentiating morpheaform basal cell carcinoma (mBCC) from desmoplastic trichoepithelioma (DTE) in the skin.This MAb is superb for staining of formalin/paraffin tissues. Catalog number key for antibody number 0882, Anti-Androgen Receptor (DHTR/882) The prefix indicates conjugation, followed by the antibody number and size suffix.